In my opinion there are few bands that are as underrated as Murder By Death. They have made some of the most intense and creative Americana music that's come out over the last decade or so. On February 3rd, they'll return with another stunning album, Big Dark Love. 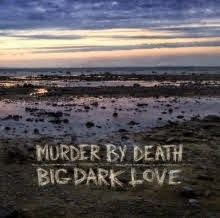 It doesn't take long for Big Dark Love to establish itself as another MBD record full of compelling Southern Gothic music. Few songs of any genre can match the intensity of "Solitary One". That intensity becomes a barely held together frenzy on "Strange Eyes" and "It Will Never Die". A Gospel music inspiration is apparent on "Send Me Home", a song that has an almost religious liberating feeling. It's the exact opposite on the menacing, brooding statement of a title track. The mountain music influence picks up on the banjo-fueled "Last Thing", which culminates in what can be best described as an evil ho-down. Things are a little less ominous on the square danceable (it's a word dammit!) "Natural Pearl". The closer "Hunted" verges on Spaghetti Western territory. The album's most accessible track is also it's first. "I Shot An Arrow" will have your head bopping involuntarily with it's sneaky ebb and flow. It's almost certain that Big Dark Love will not get the attention it deserves. But that doesn't stop it from being an early contender for album of the year and yet another entry into Murder By Death's impressive catalogue. Best tracks: "I Shot An Arrow", "Big Dark Love"